Recently, a teacher sent me a link to an article recommending books to help children understand some of the struggles their peers of color – and those friends’ ancestors – have faced in our country. The teacher hadn’t read most of the books on the list and wondered if we at the Flying Pig would recommend those titles. It is a good, if short, list; I’m familiar with almost all of the books and those I’ve read, I’ve liked. But I didn’t want to think of her classroom collection stopping there. Here is an initial list of wonderful nonfiction picture books to introduce children to these accomplished, but often less well known, individuals. I resisted the urge to sort them by field of accomplishment, because it makes for more interesting browsing and juxtapositions. Note: the summaries come from the Library of Congress and the books’ publishers. 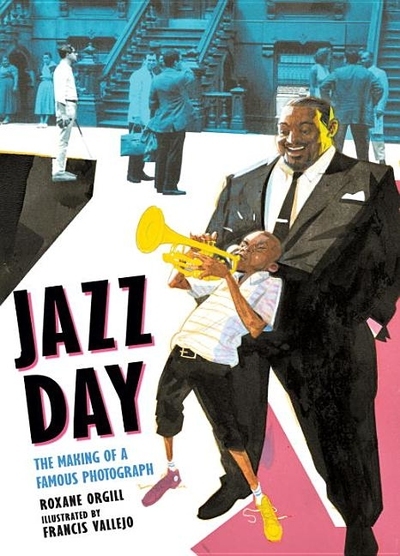 Jazz Day: The Making of a Famous Photograph by Roxane Orgill, illus. by Francis Vallejo (Candlewick) When Esquire planned an issue to salute the American jazz scene in 1958, graphic designer Art Kane pitched a crazy idea: how about gathering a group of beloved jazz musicians and photographing them? He didn’t own a good camera, didn’t know if any musicians would show up, and insisted on setting up the shoot in front of a Harlem brownstone. Could he pull it off? In a collection of poems, Roxane Orgill steps into the frame of Harlem 1958, bringing to life the musicians’ mischief and quirks, their memorable style, and the vivacious atmosphere of a Harlem block full of kids on a hot summer’s day. Radiant Child: The Story of Young Artist Jean-Michel Basquiat, by Javaka Steptoe (Little, Brown) Jean-Michel Basquiat and his unique, collage-style paintings rocked to fame in the 1980s as a cultural phenomenon unlike anything the art world had ever seen. But before that, he was a little boy who saw art everywhere: in poetry books and museums, in games and in the words that we speak, and in the pulsing energy of New York City. 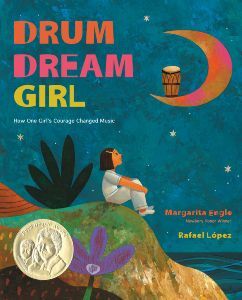 Drum Dream Girl: How One Girl’s Courage Changed Music, with poems by Margarita Engle, illus. by Rafael López (Houghton Mifflin Harcourt) Follows a girl in the 1920s as she strives to become a drummer, despite being continually reminded that only boys play the drums, and that there has never been a female drummer in Cuba. Includes a note about Millo Castro Zaldarriaga, who inspired the story, and Anacaona, the all-girl dance band she formed with her sisters. What Color Is My World? The Lost History of African-American Inventors by Kareem Abdul Jabbar, illustrated by Ben Boos and A.G. Ford (Candlewick) Kareem Abdul-Jabbar, basketball legend and the NBA’s all-time leading scorer, champions a lineup of little-known African-American inventors in this lively, kid-friendly book. 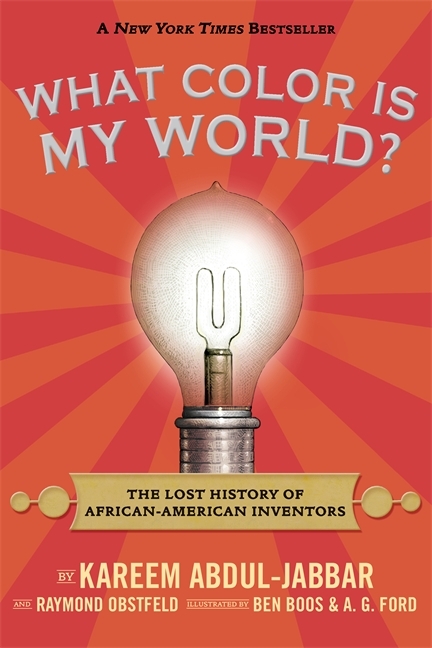 Offering profiles with fast facts and framed by a funny contemporary story featuring two feisty twins, here is a tribute to black inventors whose ingenuity and perseverance against great odds made our world safer, better, and brighter. Firebird: Ballerina Misty Copeland Shows a Young Girl How to Dance Like the Firebird, by Misty Copeland, illus. by Christopher Myers (Putnam). American Ballet Theater soloist Misty Copeland encourages a young ballet student, with brown skin like her own, by telling her that she, too, had to learn basic steps and how to be graceful when she was starting out, and that some day, with practice and dedication, the little girl will become a firebird, too. Includes author’s note about dancers who led her to find her voice. Whoosh! 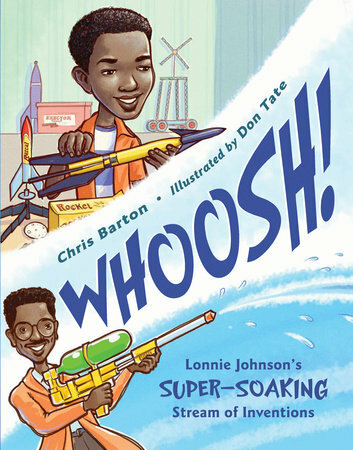 : Lonnie Johnson’s Super-Soaking Stream of Inventions by Chris Barton, illus. by Don Tate (Charlesbridge) A love for rockets, robots, inventions, and a mind for creativity began early in Lonnie Johnson’s life. His experiences growing up in a house full of brothers and sisters, his persistence, and his passion for problem solving were the cornerstones for a career as an engineer and his work with NASA. Then, while trying to create a new cooling system for refrigerators and air conditioners, inventor Lonnie Johnson instead created the mechanics for the iconic Super Soaker, one of the top 20 toys of all time. 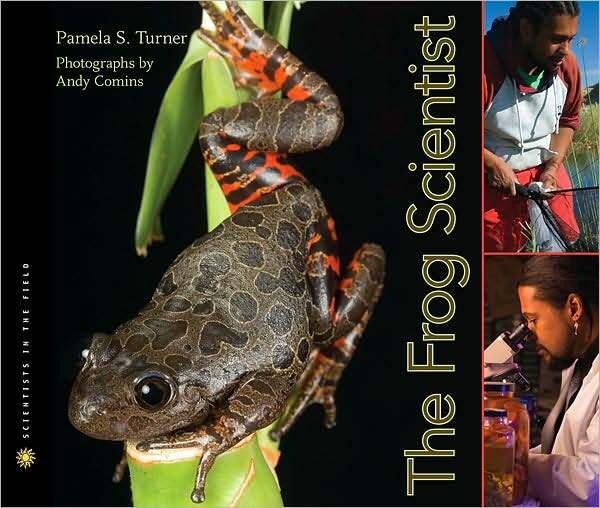 The Frog Scientist (Scientists in the Field series) by Pamela S. Turner; photographs by Andy Comins (Houghton Mifflin) Scientist Tyrone Hayes works to discover the effects pesticides have on frogs and, in turn, us. 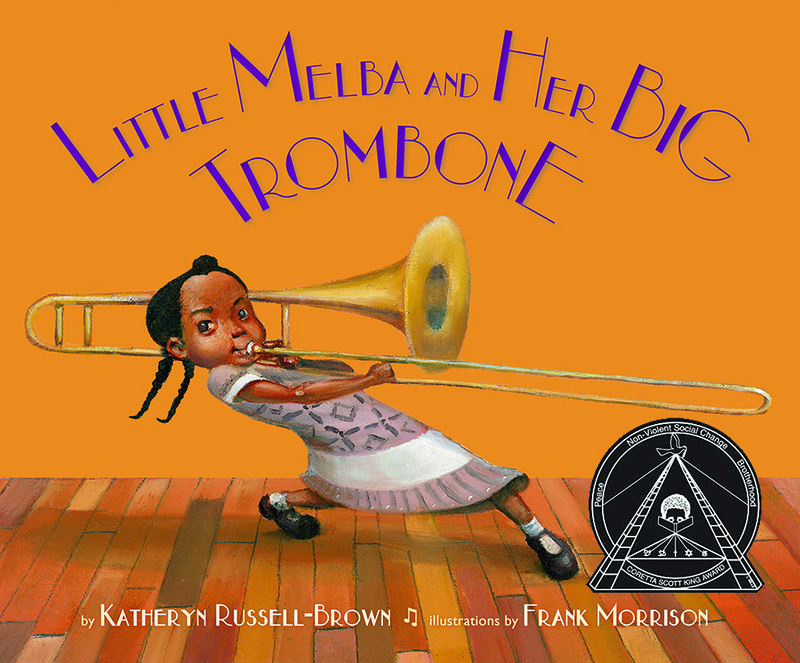 Little Melba and Her Big Trombone by Katheryn Russell-Brown, illus. by Frank Morrison (Lee & Low) A biography of African American musician Melba Doretta Liston, a virtuoso musician who played the trombone and composed and arranged music for many of the great jazz musicians of the 20th century. Trombone Shorty, words by Troy “Trombone Shorty” Andrews; pictures by Bryan Collier (Abrams) Hailing from the Tremae neighborhood in New Orleans, Troy “Trombone Shorty” Andrews got his nickname by wielding a trombone twice as long as he was high. A prodigy, he was leading his own band by age six, and today this Grammy-nominated artist headlines the New Orleans Jazz Fest. 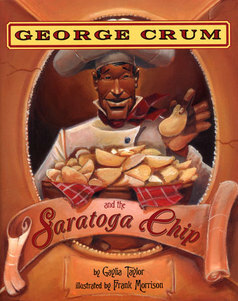 George Crum and the Saratoga Chip by Gaylia Taylor, illus. by Frank Morrison (Lee & Low) An account of the life and career of George Crum, a biracial chef who is credited with the invention of the potato chip in 1853 at a restaurant in Saratoga Springs, New York. 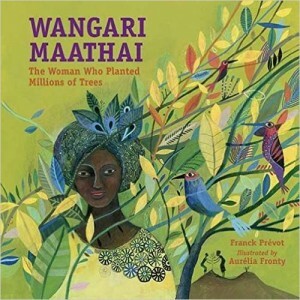 Wangari Maathai: The Woman Who Planted Millions of Trees by Franck Prévot, illus. by Aurélia Fronty (Charlesbridge) Wangari Maathai received the Nobel Peace Prize in 2004 for her efforts to lead women in a nonviolent struggle to bring peace and democracy to Africa through its reforestation. Her organization planted over 30 million trees in 30 years. 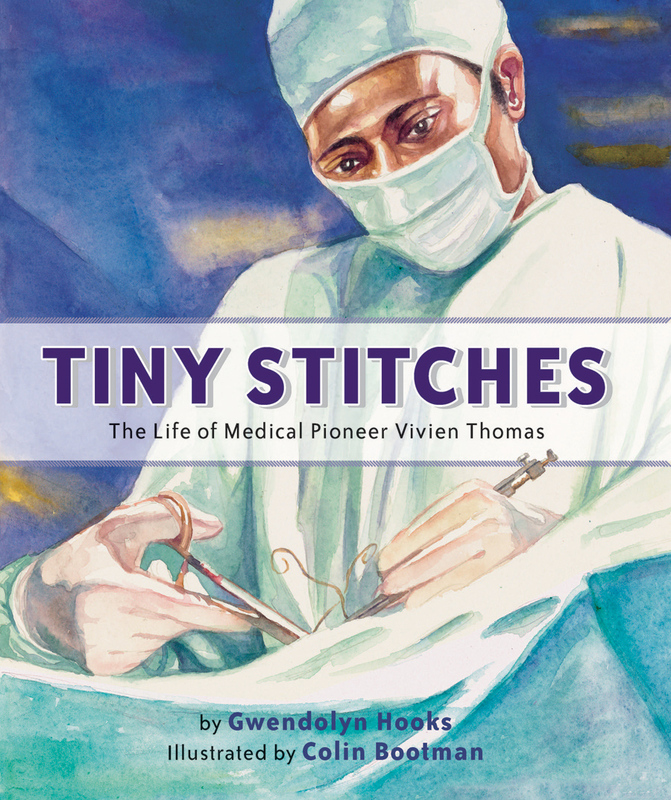 This picture book tells the story of an amazing woman and an inspiring idea. (As bookseller Ellen Richmond adds, there are several additional fabulous books about Wangari Maathai, including: Planting the Trees of Kenya: The Story of Wangari Maathai by Claire A. Nivola (FSG); Wangari’s Trees of Peace: A True Story from Africa by Jeanette Winter (Harcourt); Mama Miti: Wangari Maathai and the Trees of Kenya by Donna Jo Napoli, illus. by Kadir Nelson (Simon & Schuster); and Seeds of Change: Planting a Path to Peace by Jen Cullterton Johnson, illus. by Sonia Lynn Sadler (Lee & Low). 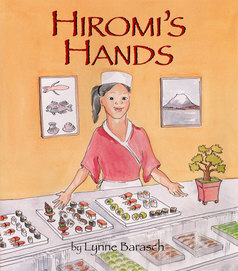 Haromi’s Hands by Lynne Barasch (Lee & Low) A biography of Hiromi Suzuki, a Japanese American girl who, with her father’s guidance, defies tradition and trains to become a sushi chef at her family’s restaurant in New York City. The Boy Who Harnessed the Wind by William Kamkwamba and Bryan Mealer, illus. by Elizabeth Zunon (Dial) After his African village was hit by a drought, 14-year-old William Kamkwamba learned about electrical windmills at a small library, and after weeks of foraging for junk parts, he did the incredible: figured out how to build a windmill that could bring electricity to his village. Everyone thought he was crazy, but William persevered and managed to create a functioning windmill out of junkyard scraps. Several years later he figured out how to use the windmill for irrigation purposes. Poet: The Remarkable Story of George Moses Horton by Don Tate (Peachtree) In the 19th century, North Carolina slave George Moses Horton taught himself to read and earned money to purchase his time, though not his freedom. Horton became the first African American to be published in the South, protesting slavery in the form of verse. 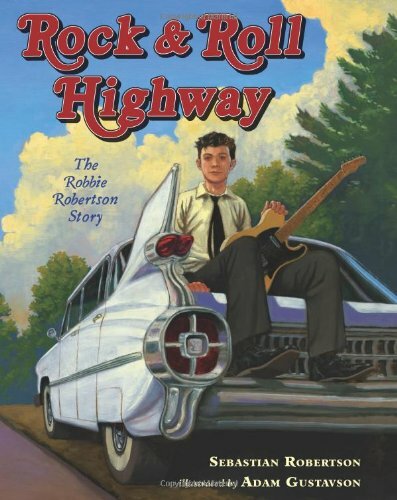 Rock & Roll Highway: The Robbie Robertson Story by Sebastian Robinson, illus. by Adam Gustavson (Holt) Canadian guitarist and songwriter Robbie Robertson is mainly known as a founding member of The Band. But how did he become one of “Rolling Stone’s” top 100 guitarists of all time? Written by Robertson’s son, this is the story of a rock-and-roll icon’s journey through musicNand his passion, drive, and determination to follow his dream. Colors of the Wind: The Story of Blind Artist and Champion Runner George Mendoza by J.L. Powers, with paintings by George Mendoza and drawings by Hayley Morgan-Sanders (Purple House Press) George Mendoza started going blind at age 15 from a degenerative eye disease. He lost his central vision and started seeing things that weren’t there–eyes floating in the air, extraordinary colors, objects multiplied and reflected back. He triumphed over his blindness by setting the world record in the mile for blind runners, and later competing in both the 1980 and 1984 Olympics for the Disabled. Now a full-time artist, Mendoza’s paintings are a National Smithsonian Affiliates traveling exhibit. Marvelous Cornelius: Hurricane Katrina and the Spirit of New Orleans by Phil Bildner, illus. by John Parra (Chronicle) A man known as the “Trashcan Wizard” sings and dances his way through the French Quarter in New Orleans, keeping his beloved city clean, until Hurricane Katrina’s devastation nearly causes him to lose his spirit. But his resilience and persistence help inspire neighbors to clean up their city and restore it to its former glory once again. 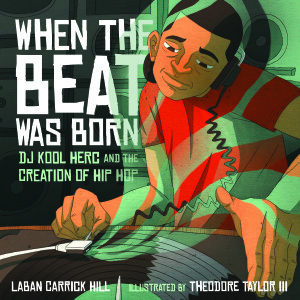 When the Beat Was Born: DJ Kool Herc and the Creation of Hip Hop by Laban Carrick Hill, illus. by Theodore Taylor III (Roaring Brook) In 1973 Cindy Campbell threw a back-to-school party at a park in the South Bronx. Her brother, Clive, spun the records. He had a new way of playing the music to make the breaks longer for dancing. Hill chronicles how he became DJ Kool Herc, how kids in gangs stopped fighting in order to breakdance, and how the music he invented went on to define a culture. 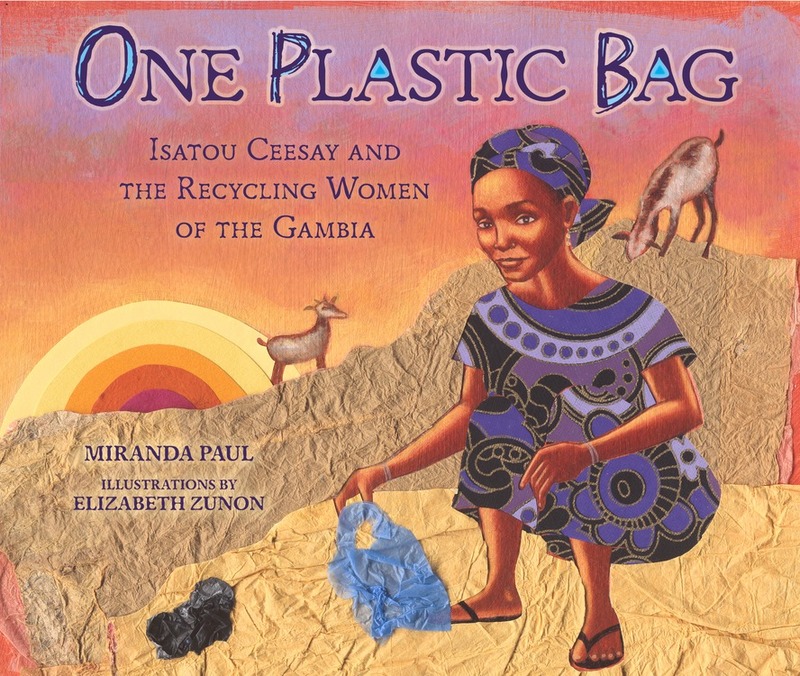 One Plastic Bag: Isatou Ceesay and the Recycling Women of the Gambia by Miranda Paul, illus. by Elizabeth Zunon (Millbrook) Plastic bags are cheap, strong, and easy to use. But what happens when a bag breaks or is no longer needed? In Njau, Gambia, people simply dropped the bags and went on their way. One plastic bag became two. Then ten. Then hundreds. Isatou Ceesay found a way not only to clean up her village by turning trash into treasure, but managed to create a vibrant economy as well. 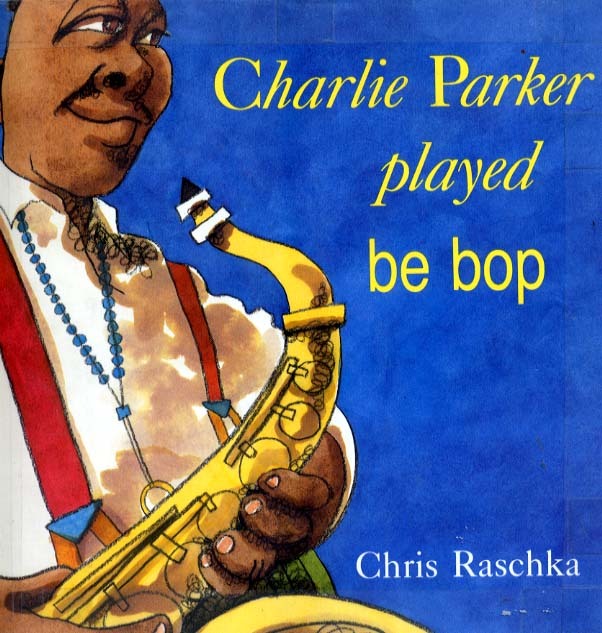 Charlie Parker Played Be Bop by Chris Raschka (Orchard) While not exactly a biography, this exuberant picture book brilliantly captures the joy and rhythm of The Bird’s music. 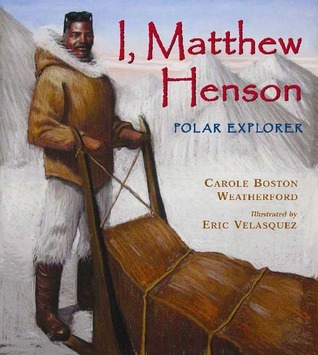 I, Matthew Henson: Polar Explorer by Carole Boston Weatherford, illus. by Eric Velasquez (Walker & Company) Matthew Henson was not meant to lead an ordinary life. His dreams had sails. They took him from the port of Baltimore, around the world, and north to the pole. No amount of fear, cold, hunger, or injustice could keep him from tasting adventure and exploring the world. He learned to survive in the Arctic wilderness, and he stood by Admiral Peary for years on end, all for the sake of his goal. And finally, after decades of facing danger and defying the odds, he reached the North Pole and made history. 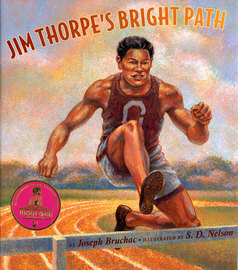 Jim Thorpe’s Bright Path by Joseph Bruchac, illus. by S.D. Nelson (Lee & Low) A biography of Native American athlete Jim Thorpe, focusing on how his boyhood education set the stage for his athletic achievements which gained him international fame and Olympic gold medals. Mae Jemison (Great African-Americans series) by Luke Colins (Capstone) Explore the life and achievements of the first African American female astronaut, Mae Jemison. Astrophysicist and Space Advocate Neil deGrasse Tyson by Marne Ventura (Stem Trailblazer Bios) (Lerner) As a kid, Neil deGrasse Tyson was starstruck when he first visited a planetarium. 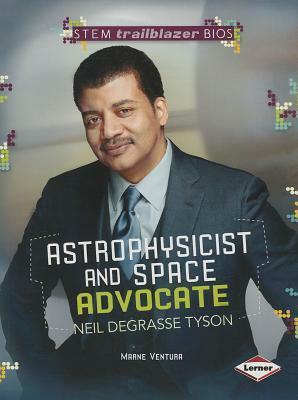 Tyson pursued his interest in astronomy and studied to be an astrophysicist. In 1996, he became the director of New York’s Hayden Planetarium. Known for making science fun and easy to understand, he has hosted and appeared on TV shows such as Nova ScienceNow and The Daily Show with Jon Stewart. He even has more than one million Twitter followers! But how did he get there? Follow his path from fascinated kid to popular space expert. 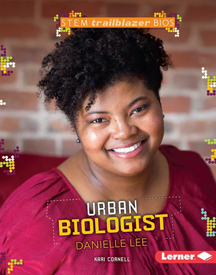 Urban Biologist Danielle Lee by Kari Cornell (Stem Trailblazer Bios) (Lerner) As a child, Danielle Lee loved looking at plants and animals. Lee’s love of biology and rap and hip-hop music led her to become an urban scientist, teacher, and popular blogger. The Amazing Age of John Roy Lynch by Chris Barton, illus. 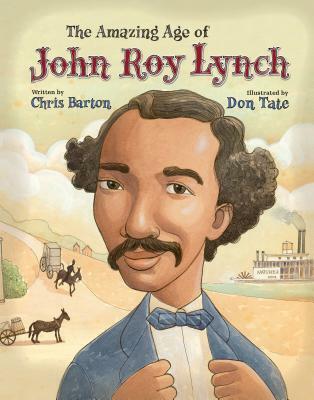 by Don Tate (Eerdmans) A picture book biography of John Roy Lynch, one of the first African-Americans elected to the United States Congress. 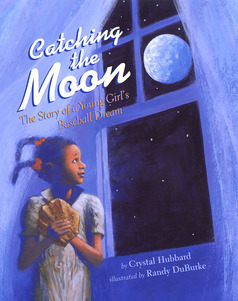 Catching the Moon: The Story of a Young Girl’s Baseball Dream by Crystal Hubbard, illus. by Randy DuBurke (Lee & Low) The spirited story of Marcenia Lyle, the African American girl who grew up to become “Toni Stone,” the first woman to play for an all-male professional baseball team. 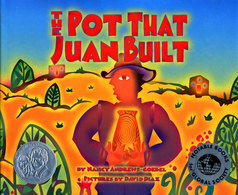 The Pot That Juan Built by Nancy Andrews-Goebel, illus. by David Diaz (Lee & Low) The story of Juan Quezada and his journey from discovering ancient methods of making pottery to becoming the premier potter in Mexico. Piano Starts Here: The Young Art Tatum by by Robert Andrew Parker (Random House/Schwartz & Wade) Tatum came from modest beginnings and was nearly blind, but his passion for the piano and his acute memory for any sound that he heard drove him to become a virtuoso who was revered by both classical and jazz pianists alike. Jazz ABZ: An A to Z Collection of Jazz Portraits by Wynton Marsalis, illustrated by Paul Rogers (Candlewick) A is for “almighty” Louis Armstrong, whose amazing artistry unfolds in an accumulative poem shaped like the letter he stands for. As for sax master Sonny Rollins, whose “robust style radiates roundness,” could there be a better tribute than a poetic rondeau? In an extraordinary feat, Pulitzer Prize-winning jazz composer Wynton Marsalis harmonizes his love and knowledge of jazz’s most celebrated artists with an astounding diversity of poetic forms — from simple blues (Count Basie) to a complex pantoum (Charlie Parker), from a tender sonnet (Sarah Vaughan) to a performance poem snapping the rhythms of Art Blakey to life. Coming Home: From the Life of Langston Hughes by Floyd Cooper (Philomel) Young Langston Hughes was a dreamer. He dreamed about heroes like Booker T. Washington, who was black just like him. When he heard the clackety-clack of train wheels, he dreamed about the places it had been. But most of all, he dreamed about having a happy home. And so, one day, he began turning those dreams into beautiful prose. As he did, he discovered where his home really was: in the words and rhythms of his poetry that reached people all over the world. 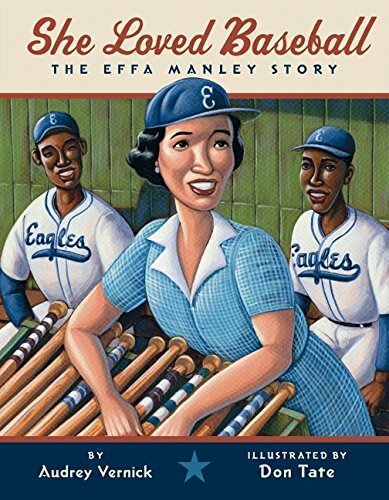 She Loved Baseball: The Effa Manley Story by Audrey Vernick, illus. by Don Tate (HarperCollins) Effa always loved baseball. As a young woman, she would go to Yankee Stadium just to see Babe Ruth’s mighty swing. But she never dreamed she would someday own a baseball team. Or be the first – and only – woman ever inducted into the Baseball Hall of Fame. Just a Lucky So and So, The Story of Louis Armstrong by Lesa Cline-Ransome and James Ransome (Holiday House) Relates the story of jazz innovator Louis Armstrong’s rise from street waif to international superstar. Gordon Parks, How the Photographer Captured Black and White America by Carole Boston Weatherford, illus. by James Christoph (Albert Whitman) Gordon Parks is most famous for being the first black director in Hollywood. But before he made movies and wrote books, he was a poor African American looking for work. When he bought a camera, his life changed forever. He taught himself how to take pictures and before long, people noticed. His success as a fashion photographer landed him a job working for the government. In Washington D.C., Gordon went looking for a subject, but what he found was segregation. He and others were treated differently because of the color of their skin. Gordon wanted to take a stand against the racism he observed. With his camera in hand, he found a way. Told through lyrical verse and atmospheric art, this is the story of how, with a single photograph, a self-taught artist got America to take notice. 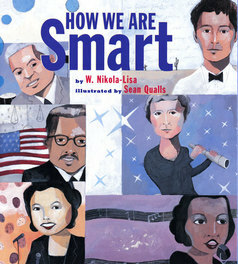 How We Are Smart by W. Nikola-Lisa, illus. by Sean Qualls (Lee & Low) Through direct quotations, verse, and prose, presents the achievements of a diverse group of people who illustrate Dr. Howard Gardner’s theory of multiple intelligences. Again, please feel free to add titles to this list. Just remember that JOY is the goal for these picture books! All children have to learn from is their environment and whatever they see in the media and read in books they have direct access to. I can’t think of anything more effective than creating rich environments and pursuing inclusive media that show an accurate picture of our world, a world made so much better and richer for the efforts and achievements of brilliant men and women of color, many of whose stories are just beginning to be told. Children thrive on stories of inspiration and hope, especially when they can see flickers of themselves and their own potential in those stories. This entry was posted in Uncategorized on September 9, 2016 by Elizabeth Bluemle. And I almost forgot! Also my picture book, José! Born to Dance, illustrated by Raúl Colón. Don’t forget Gary Golio’s JIMI: Sounds LIke a Rainbow: A Story of the Young Jimi Hendrix, illustrated by Javaka Steptoe; Spirit Seeker: John Coltrane’s Musical Journey, illustrated by Rudy Gutierrez; and Bird & Diz, illustrated by Ed Young. It was an enormous amount of fun to work on! Ooh! I didn’t know about the HVAC system, and had just heard a snippet somewhere about the micro-computer. Thanks so much for alerting us to this series! The East-West House: Noguchi’s Childhood in Japan, written and illustrated by Christy Hale. Dreaming Up: A Celebration of Building, written and illustrated by Christy Hale. A collection of illustrations, concrete poetry, and photographs that shows how young children s constructions, created as they play, are reflected in notable works of architecture from around the world. Ah! So many great books. A lot I haven’t read yet so I’m excited to check them out. The one about the potato chip man is intriguing me & I’ve been wanting to read that Jim Torpe one for the longest time. There are several other books about Wangari Maathai as well: Planting the Trees of Kenya: The Story of Wangari Maathai; Wangari’s Trees of Peace: A True Story from Africa (Jeanette Winter); Mama Miti: Wangari Maathai and the Trees of Kenya; and Seeds of Change: Planting a Path to Peace. Also Carmen Agra Deedy’s 14 Cows For America has just gone into paperback. It’s an amazing story. Ooh! All great books, Ellen. Thanks for adding all of the other Wangari Maathai titles. Love 14 Cows, too!